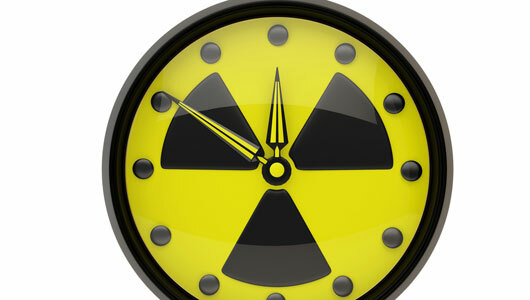 According to official estimates, the Islamic Republic of Iran is now roughly a year away from acquiring a nuclear bomb. Well, that is, if it were actually building a nuclear bomb. Which it's not. "Right now, we think it would take over a year or so for Iran to actually develop a nuclear weapon, but obviously we don’t want to cut it too close," President Barack Obama told an Israeli television station on March 14, 2013. In order to stop Iran, Obama vowed to "continue to keep all options on the table," a euphemism for engaging in an unprovoked military attack, thus initiating a war of aggression, the "supreme international crime." Obama's statement came just two days after his own Director of National Intelligence told a Senate committee that the Iranian government had not made a decision to weaponize its legal, safeguarded civilian nuclear energy program. "We do not know if Iran will eventually decide to build nuclear weapons," DNI James Clapper said. Even if it did, he added, Iran wouldn't be able to secretly divert any of its stockpiled and safeguarded enrichment uranium to a weapons program. The American president failed to make this distinction in his interview, instead saying only that a nuclear-armed Iran would be "dangerous for the world. It would be dangerous for U.S. national security interests." Repeating his administration's main talking point, Obama told his Israeli interviewer, "What I have also said is that there is a window, not an infinite period of time, but a window of time where we can resolve this diplomatically and it is in all of our interests." But this window has already been open for decades and Iran has supposedly been only a year away from a bomb for the past ten years. In November 2003, then Mossad chief Meir Dagan told the Knesset Foreign Affairs and Defense Committee that Iran's nuclear program would be at a "point of no return" within the next year and would then "have the potential to produce 10 nuclear bombs a year." Israeli Defense Minster Shaul Mofaz repeated the one year "point of no return" timeline in early 2005, a claim reinforced by other Israeli officials throughout that year. Similar estimates were made in 2006, 2007 and 2008. Oh, and 2009. In April 2010, Ronald Burgess, director of the U.S. Defense Intelligence Agency, told the Senate Armed Services Committee that the "general consensus" was that Iran could develop a single nuclear bomb within a year if the leadership decided to do so, despite maintaining that Iran didn't have an active nuclear weapons program. As the years have passed, this assessment has held fast. In late January 2011, Aviv Kochavi, director of Israeli Military Intelligence, admitted Iran was not actively working on a nuclear weapon, but claimed it could build one in "a year or two" once "the leader decides to begin enriching at 90 percent." A year later, in January 2012, Defense Secretary Leon Panetta told 60 Minutes, "The consensus is that, if they decided to do it, it would probably take them about a year to be able to produce a bomb." Just few days later, Kochavi told a panel at the Herzliya security conference that "Iran has enough nuclear material for four bombs," adding, "We have conclusive evidence that they are after nuclear weapons. When Khamenei gives the order to produce the first nuclear weapon – it will be done, we believe, within one year." Last week, addressing the very same conference, Kochavi was back with a new prediction - actually, it was the same one as before. He claimed that, in the coming year, the Iranian "leadership would like to find itself in the position of being able to break out to an atomic weapon stage in a short period of time, according to the IDF's intelligence assessments. However, he said that Iran has not yet decided to build the bomb." Greg Thielmann, a former U.S. intelligence analyst now with the Arms Control Association, recently explained that "calculating such a time line involves a complicated set of likely and unlikely assumptions," telling journalist Laura Rozen, "If Iran decided today to build nuclear weapons, it would require years, not weeks or months, to deploy a credible nuclear arsenal." Meanwhile, with Obama set to visit Israel this week, Reuters now notes that "Netanyahu has not publicly revised the spring-to-summer 2013 dating for his 'red line'," the stated point at which the Iranian nuclear program advances far enough to automatically trigger an Israeli attack, a threat laid down by the Israeli Prime Minister last September. "But several Israeli officials privately acknowledged it had been deferred, maybe indefinitely," Reuters adds before quoting an anonymous official: "The red line was never a deadline," he said. Clearly, when it comes to propagandistic prognostications about the imminence of an Iranian bomb, they never really are. I'm pretty sure Iran wants a nuke, because they simply have to get one now. Pakestan, N.Korea, considered by Iran to be far lesser countries, have this grand bargaining chip, and look at the riches the West is pouring at their feet! Oh, and Israel has them too! And threatens Iran with midnight bombing raids, on every weekly Sabbath. While this may not concern you. I think it should. Given the very plans that are being dusted off and implemented for nuclear development in Iran, are the very same ones the Shah had in mind, Iran has no choice now but to learn international negotiations from the Cold War, and begin the game anew, a Warmer one, with the "threat" of Mutually Assured Recreation, as the carrot AND the stick to securing it's sovereignty, and ensuring that no one but NO ONE would EVER think of attacking Iran under ANY circumstances, INCLUDING covert or not so covert Regime Change. While all this would be reasonable for an innocent country under fire for merely having the stones to disagree with Western principles of modern governance, Iran is no innocent. The people certainly are, but the top 20 chiefs running the show there, aren't. As are the top 20 chiefs on this side. So 20+20 (+10 in Israel) makes about 50 top people who recklessly wield unreasonably big powers, that unfortunately condemn 70 Million + 350 Million + 8 Million, to a state of heightened apprehension, tension, and the expectation that ultimately, unfortunately yet more blood will have to be spilled. More American blood, and a fresh new Iranian (and possibly Israeli) blood added to the ocean of Iraqi and Afghan blood already consumed by the abject failure of 50 people to put aside ego and the perceived power they think they have. Iran should stop all its nuke weapon project and concentrate only with nuclear energy (although they don't need it yet). I know that most of the Iranians, which half of them are Persians, want that solution too. Its better to do it in peace rather than by American massive attack. I hope that the Mullahs regime will fall and the Iranian people will be free for the first time in their long history!